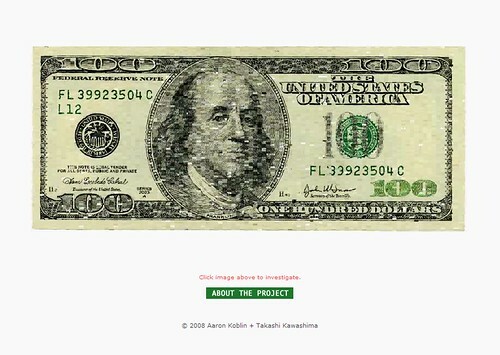 Ten Thousand Cents is a digital artwork that creates a representation of a $100 bill. Using a custom drawing tool, thousands of individuals working in isolation from one another painted a tiny part of the bill without knowledge of the overall task. Workers were paid one cent each via Amazon's Mechanical Turk distributed labor tool. The total labor cost to create the bill, the artwork being created, and the reproductions available for purchase are all $100. The project was a collaboration between Aaron Koblin and Takashi Kawashima. Ten Thousand Cents from Ten Thousand Cents on Vimeo.